Blaschke Umwelttechnik supplies exhaust extraction systems that significantly reduce air pollutants in industrial workplaces. Blaschke Umwelttechnik offers a variety of high-quality emission reduction products, ranging from simple to automatic solutions, for any industry or application. When working in vehicle manufacturing, maintenance and testing, as well as in storage or loading areas, engines run in closed or poorly ventilated areas and produce considerable levels of pollutants. Hazardous fumes such as fine particulates, soot and carbon dioxide have a negative impact on the environment, as well as affecting staff health and wellbeing. Blaschke Umwelttechnik sources extraction systems direct from manufacturers, to provide clean air and better working atmospheres. Blaschke Umwelttechnik is committed to creating an optimum environment for both people and products at the different stages of manufacturing where fumes, smoke or dust are produced. For nearly four decades, the company has been solving technically demanding challenges across every type of industrial application. Blaschke Umwelttechnik always delivers the most suitable solution for the task at hand, whether using simple or state-of-the-art technology. The highly experienced team will create, plan, install and maintain complete environmental technology systems and solutions for all industrial clients. From planning to execution, Blaschke Umwelttechnik shares with customers its wealth of knowledge in consulting and project planning, delivery, assembly and commissioning, test run and documentation, as well as maintenance and repair. Blaschke Umwelttechnik delivers proven solutions for the repair and maintenance of special-purpose vehicles, such as excavators and construction machines, at all kinds of indoor workplaces, especially indoor cranes. Systems can be combined for maximum effectiveness and suitability. The company’s strength lies in its functional system design for the collection of dangerous exhaust fumes. This applies to combustion engines for all manufacturing processes and types of requirements, from final assembly and retrofitting to test stations. Its goal is to remove exhaust fumes from the moment a vehicle enters the building, right through to when it leaves. Blaschke Umwelttechnik’s aluminium slotted extraction rails SSK are mechanically or electrically propelled exhaust trolleys with computerised control systems, return rails and curved elements. They also have patented switch points and slide switches for changing tracks. The rails can be adapted with further automation components to integrate them into more complex production processes, such as assembly lines in the automobile industry. Blaschke’s aluminium slotted rail system is suitable for industrial use, as well as maintenance areas, repair shops and garages. The company also supplies extraction-rail return tracks / elbows for round-trip use (ring system with or without switch) on assembly and test-run lines. Return tracks enable continuous circulation of trolleys by guiding them back to the starting line of the system. Through the use of automation components, this top-quality rail system can be integrated into complex production processes. Blaschke Umwelttechnik has been delivering effective emission control and air quality management solutions to worldwide clients, for more than 40 years. In future, we would like to inform everyone quickly and comprehensively about our products and projects. Blaschke offers exhaust emissions extraction equipment for vehicles and other air pollutants, to improve air quality in industrial environments. Blaschke supplies an exhaust extraction system for mining excavators with two swivel arms. The company's special strength lies in functional system design for the collection of dangerous exhaust fumes from combustion engines for all manufacturing processes and for all kinds of requirements from final assembly and retrofitting to test stations. 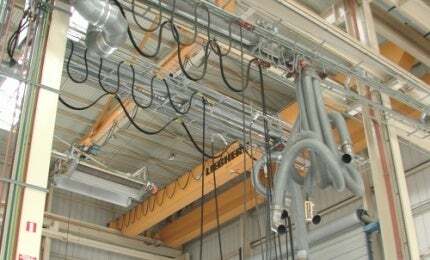 Blaschke offers exhaust extraction systems that are available with a swivel arm up to a maximum of 8m in boom length. Blaschke offers exhaust extraction solutions specifically for fire stations and emergency services. Blaschke delivers unique, custom-made emission capture solutions for industrial workshops and sites.